INTRODUCTION In patients with a previous history of abdominal surgeries or loco-regional treatments for hepatic tumors, abdominal adhesions may interrupt the performance of subsequent therapy using the laparoscopic approach. We have been attempting the preoperative detection of abdominal wall adhesion, using ultrasound in order to achieve a safer Laparoscopic hepatectomy (LH) for liver tumors. METHODS AND PROCEDURES Twenty-four patients awaiting LH for hepatic tumor with a history of previous abdominal surgeries or loco-regional treatments for hepatic tumor were involved in this study. Preoperative transcutaneous ultrasonic examination of the abdominal wall was performed using an 8 MHz linear-array B-mode ultrasound scanner (Toshiba, Aplio, PLT805AT). The whole abdomen was explored by longitudinal scanning in the spine position. Attention was directed to the margin between the peritoneum and the intraabdominal components, called viscera. The abdominal adhesion was evaluated into 3 grades: not adhered, mildly adhered, and severely adhered. These grades were defined by the clearness of the gap from the sliding movements between the peritoneum and viscera accompanying spontaneous respiration. These findings were preoperatively mapped. In the LH, the initial laparoscopic access was made using the open entry technique from an adhesion-free area, which was predicted by the map. After the pneumoperitoneum, the actual condition of the adhesion was inspected. Following the adhesiolysis, when necessary, LH was performed. RESULT The preoperative ultrasonic examination took only 10 minutes. The adhesion mapping was often in line with intraoperative findings. It was utilized to make preoperative decisions in the positioning of trocars and the necessity of adhesiolysis. Detection of adhesion was highly reliable with 100% of positive predictive value, 95.7% of sensitivity and 100% of specificity. The success rate of the first trocar insertion was 95.8%, and subsequent LH’s were successfully performed in all 24 patients. 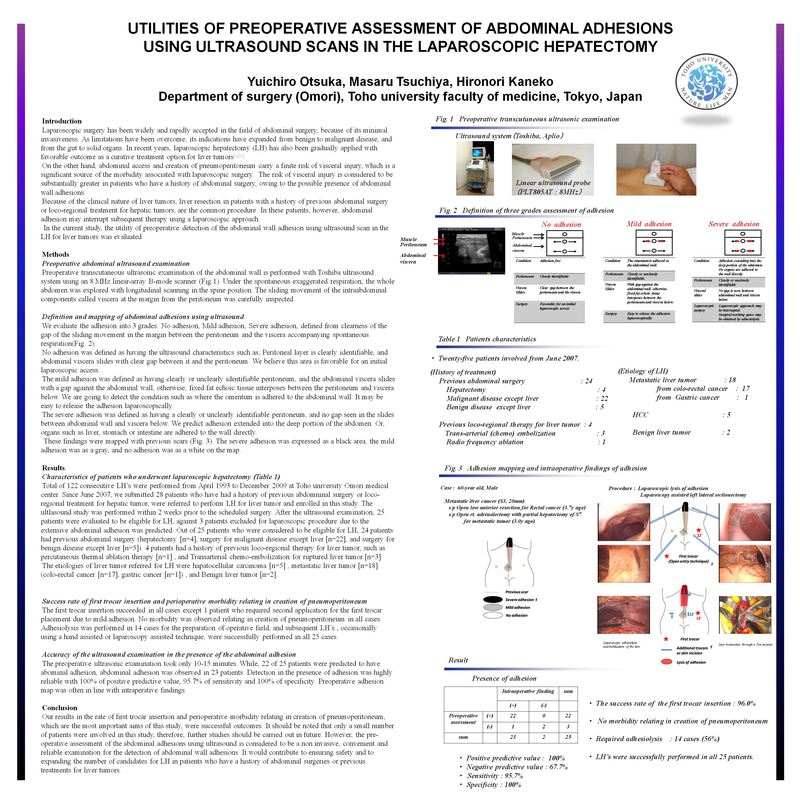 CONCLUSION Pre-operative assessment of the abdominal adhesions using ultrasound is considered to be a non invasive, convenient and reliable examination for the detection of the abdominal wall adhesions. It would contribute to ensuring the safety and the increase in the number of candidates for Laparoscopic hepatectomy, in patients who have a history of abdominal surgeries or previous treatments for liver tumors.